Donald Trump has made no secret that he wants to live in a less globalized world. He has spoken at length about sealing borders, coercing long-lost jobs back to the US, and punishing foreign countries for perceived economic slights. In order to pry America free from its global obligations Trump wants to throw out decades of free trade deals, and kill those under negotiation. That part of Trump’s plan may not require him to be president. Neither he nor Hillary Clinton support the TPP, the largest trade deal currently under negotiation. The candidates low ambitions for free trade and economic cooperation reflect a multi-year globalization rut that shows few signs of reversing course. The rhetoric is important, but the numbers also support the idea that something unusual is happening. In September the World Trade Organization (WTO) was forced to revise its global trade estimates for both 2016 and 2017. It now projects that trade will grow at just 1.7% this year, its slowest rate since the financial crisis. The US Bureau of Economic Analysis records that from 2014 to 2015 the total value of US exports declined 5%. Imports declined 4%. There are some pedestrian causes for this: Plummeting oil prices, weak commodities, and a strong dollar. But it’s nevertheless a rare enough occurrence to be noteworthy. 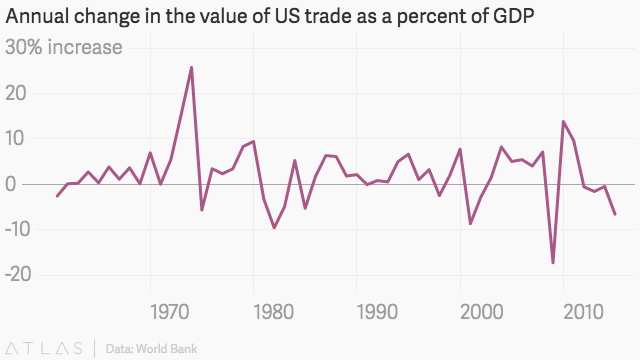 Since the 1960’s total US trade value has almost never fallen outside of a recession. Over the summer US imports and exports returned to flat or slightly positive growth. However, there remains a big hill to climb to restore the robust trade that normally characterizes periods of economic growth. A new president won’t be the only thing standing in the way of a trade rally. By at least one measure, the US is throwing up more new barriers to trade than any other nation. Many of these are multi-million dollar earmarks that ensure federally-funded projects go to US companies. Even if American attitudes toward free trade were to turnaround and become more positive, it’s not clear anyone will be willing to negotiate. According to the WTO, the US has weathered the global slowdown better than countries in Europe and the far east. Many of those countries are adopting protectionist measures of their own—Brexit being only the most obvious example.